Does anyone else feel single AF? A Japanese couple just raised the bar, and probably put ALL your honeymoon plans to shame. For 400 days, Kaz and Mariko Yamaguchi traveled to 48 countries, and recorded the entire trip on their epic journey with a drone—a DJI Phantom 3 Advanced, in case you were wondering. Apparently, the new trend now is taking "dronies" instead of selfies. LOL! It might be time to up your game. 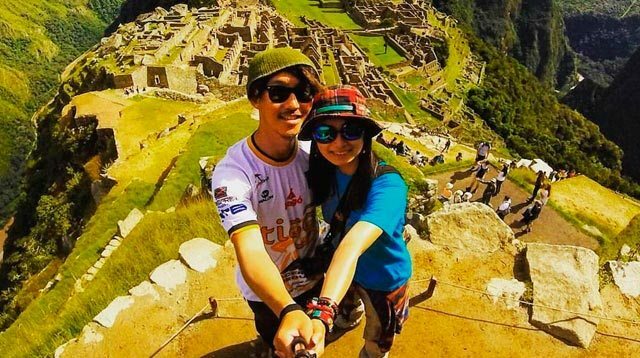 The sweet duo from Kyoto went to some of the most amazing places, including Dubai, Colombia, Bolivia, Ethiopia, and Peru—making them both #relationshipgoals and #travelgoals. Here are some of our fave shots of Kaz and Mariko.